You need to be active all day in order to prevent cancer. 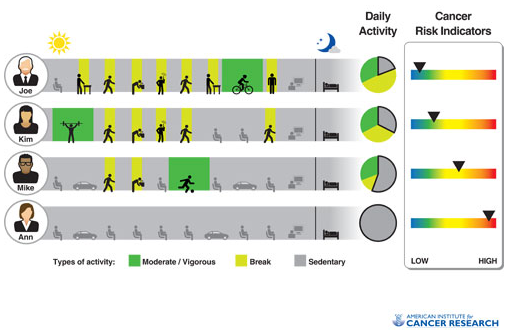 Your daily activity is strongly linked to the risk of getting cancer. Sitting in front of the computer all day, then driving home and watching TV in the evening can in the long term be an important factor for developing cancer. Sitting all day can shorten your lifespan by up to 7 years. Being physically inactive can cause a lot of health problems that can kill you in the long term. The World Health Organization states that a sitting lifestyle is the fourth leading risk of death. Obviously, it doesn’t happen overnight, but sitting for long periods of time without breaks or changing the sitting position for days, weeks, months and years can lead to chronic diseases like diabetes, kidney disease, cardiovascular health problems, poor mental health or obesity. A standing desk is not enough. Newest studies proof that working in a standing position instead of sitting all day is just one part of the success story. Standing is, of course, better than sitting, as your body burns 3x more calories and in general your body is more active, but you’re still just standing in a fixed position without a lot of movement. In order to keep our body healthy, we need to give him an impulse from time to time that wakes him up from standby mode. Standing up from your chair is more effective than just walking away from your standing desk. The optimal solution is a short exercise that can energize your body and get your productivity back on track. Standing is good for your only in short breaks.In the long term, it can cause varicose veins. A study that was made in Denmark in 2005 shows found out that those who stand or walk at least 75 percent of their work time have a higher risk of hospitalization due to varicose veins disease. Even if you’re having a standing desk your still inactive.Sure it’s better than just sitting all day, but you’re still not moving enough. Exercising after work won’t do it either. You need to physical active all day long. Riding on your bike or going swimming after 8 hours sitting marathon won’t repair the damage done during the sitting period. To be healthy you have to do two things. Stand up optimally least every 30 minutes and do short exercises from time to time. Read more about why sitting all day is slowly killing you. See how Curie can help you.